I'm back!!! There are a ton of photos I want to share with you all from my trip but I will hold off and keep this post all about the crafty frenzy I had this weekend. I am slowly going through posts and hope to be caught up this week if I'm lucky, since this is the last week before I head back to school...sigh. Summer's end always makes me a wee bit sad. But this weekend, I tried to forget all about the onset of school and cooler temps and got crafting. I went on a fabric shopping trip with my cousin-in-law gf and we spent about 3 hours at Dress Sew. A fabric lover's heaven. While she picked out funky and fun fabrics with chickens and horses for her child to be, I found some wonderfully soft yarns on sale for $1.99! There were only three colours so I scooped them up. I also found two pretty fabrics that I know I will use at some point. Let me back up a bit on my two big projects I have started. While we were on our vacation on the Sunshine Coast, there is this marvelous quilting shop that we have cycled by a number of times and I always exclaim while cycling by, rather loudly since we are on bikes, "I really want to go there baby!!!" To which my baby replies (for the past 4 years) "Next time!! Let's just get to the ferry!" So this time, as we had a bunch of time to kill waiting for the ferry, I finally got a positive response to my query..."Let's go to that quilting store you've always wanted to go to." YESSSSSSSSSSSSSSSSSSSSSS!!!!!!!!!! So off we went and I was giddy with delight at the selection of fabrics. Let me back up yet again. Before my vacation, I read Nicola's post about her jelly roll quilts that she made and linked a video about the jelly roll races. I was hooked; line and sinker. I wanted to make one!! So I started researching jelly rolls and found that Vancouver, as massive as it is, doesn't have quilting stores. SERIOUSLY VANCOUVER... GET WITH THE PROGRAM!!!!!!! Anywho, I was going to order a pretty jelly roll online from Moda, but with shipping it would've cost a lot. Back to my trip....while I was browsing the amazing quilting store, where there were machines on "sale" for $8000! !, I asked the lady "Do you have any jelly rolls?" To which she replied, "Why yes we do!" And showed me...GASP...the Moda jelly roll I was yearning for online!! Yahoo! It was on sale too. So I looked to my hubby and said "Pretty please!! I will make us a fabulous quilt!" And he said "Yes!" Wow...I should've gone for more if he was in such a carefree mood. Back to present time, IHSW weekend...so it began with a sewing Saturday with my cousin. I unraveled the jelly roll and started sewing the pieces together. It takes a lot longer than an hour to do since I'm not even finished sewing all the parts together. Disorganized mess makes me panic! The strips sewn together in a jumble. I can't stand jumbles and even though the ladies on the video say "Don't worry, this is not a fussy quilt" I had to iron them all out and organized the strips....I'm too particular with details as my cousin and husband say! Much better!! Here's where I'm at now. So far I have 4 panels sewn and I'm going to make it into 8 panels tonight. Maybe16 if my back doesn't give me too much pain. The red and brown beneath the panels are going to be my backing and front panels to frame the quilt. We picked that out today and the lady at Fabricland was AMAZING. She helped me with the dimensions, the colour choices and even drew me a design. I love her!! After researching quilting online, I have decided once all the parts are together, I will hand quilt it. Since I cross stitch...lol...I think the rocking hand motion will be fine for me. I like stitching in hand at times and I want this quilt to be really special. 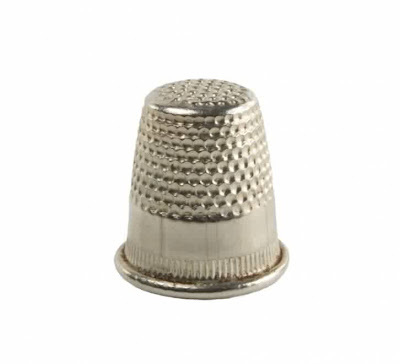 Guess what I never knew what this object is for and feel silly admitting it to all of you... a THIMBLE! It's for quilting!! AHAHAHA!! I always thought it was for embroidery or darning or something.....never for quilting...silly me. The rubber thimble is for your index finger!! My Nana has one that I used to play with as a child. To all you quilters...if you have any tips or tricks for me that have helped you quilt please pass them along to me! I will collect them all and print a copy to refer to. Onto the second big project. Remember way back when I talked about granny squares and attempted to make one? Well, I've been wanting a decent selection of yarns that are of the same weight? consistency? to make one really large granny blanket. I'm not making several little squares but one massive one. Check out Bunny Mummy's large granny. I spent quite late last night trying different methods and was getting frustrated with the differences in patterns. My eyes were hurting so I put it down to work on it another day. I think it looks okay. The lady's pattern I'm following reverses the square and I'm not sure if I like that method as the chain stitch gets a bit wonky. Again...I'm toooooo picky and precise! Stitching? Yes, I did some of that too! I finished BBD's Bluebird as a Redbird and stitched a Hannah motif. I don't think I'll have Hannah done by the end of summer...possibly September. That's my new goal. I am also stitching a little RAK for someone and picking out three more to make. If only I had more time!! Last but not least, before we bought the quilting fabric, we browsed through the Salvation Army and found this great hardcover book for $2.99 on Traditional Samplers! Great book at a great price! I love this sampler and hope to make it one day. I miss everyone and am looking forward to reading your posts and catching up. Thank you all for your lovely comments on my last few posts. I haven't been very diligent with responding but I mean to!! I'm always inspired, uplifted and grateful for each and every one of you!! Ok, what is that Moda Jelly Roll? You can't show yummy fabric and not say what the fabric collection is. lol! it looks great so far! You're doing great! Hand quilting. Um. lol! Yeah, the rocking method is a good way to go. I tended to use the smallest needles (size 12 quilting needles) cause I felt it helped to make small stitches. I didn't use a thimble underneath but I did use a thimble with a lip around the edge on top. The lip helped to keep the needle on the thimble. Get a few stitches on the needle before you pull the thread through. Use your underneath finger to gauge how far your needle is sticking down and that should be the way to tell if the stitch will be short or long. Clear as mud, right? lol! It's been a while since I've hand quilted, but I did love doing it. Anyway, love all your projects! Pretty fabric, pretty yarns, nice crochet so far, nice stitching too! What fun! I see what you mean about the multiple projects. lol! You have been one very busy crafting lady. I love the colors in the Moda fabric. Can't wait to see your trip. When we first moved out here, I took the DH to the Sunshine Coast as a surprise trip. It is a beautiful area!! Wonderful projects....you certainly have been busy. Wonderful post of crafty goodness!! Wow, you have been one busy lady! I, too, love jelly rolls and yours looks fantastic! I started a granny square afghan way back in the Stone Age when I was young, but never did finish it. Granny squares were the reason I learned how to crochet! Love your BBD birdie and Hannah and can't wait to see your quilt and humongous granny square made up! Absolutely beautiful fabrics! Lucky gal! Nice that you are an all around crafter! Love your work. Wow, what a busy weekend, and so much lovely crafting, too! The thrift store book looks awesome! It's so fun to see what kind of stitching stuff is at Goodwill and Salvation Army, I even found a Scandavian Christmas cross stitch book once. If you don't mind my asking, what kind of floss is Redbird? The red to black is gorgeous. uh-oh, there's no hope for you now - your place will be filled with fabric in no time. Trust me, it had happened to me! Vancouver has The Cloth Shop and they've been around for ages in West Point Grey, then they moved down to Granville Island last year. They are a great quilt shop but you gotta get down to GI! I'm glad you finally got to stop off at that quilt shop on the sunshine coast! Have fun! Wow, lots of lovely news! Your quilt is going to be *gorgeous* :) Quite a while ago I discovered Clover thimbles, which I use for embroidery; I reviewed them at the bottom of this post, and my admiration has only increased since. They are lidded at the top, like Margaret mentions, and are actually *meant* for hand-quilting! They are expensive, but well worth the price! About your Granny Squares - I see what you mean, the reversing does give it a different look. I recently saw these beautiful African Flower Granny Squares, and am very tempted to try them ;) Looking forward to hearing more about your trip! Wow, your weekend was definitely filled with needlework. A jelly roll quilt is my dream too but I can only dream of a Moda jelly roll. There isn't a fabric shop in my region where I could get Moda fabrics. Maybe I can find an online shop where I could order such a jelly roll. Your fabrics look gorgeous and I'm looking forward to seeing what kind of quilt you will make. A great adventure! I so much like stash shopping!! Lots of crafty busy-ness . Wow, lots of different crafts going on here! I love the color palette you chose for the quilt, I bet it's going to look lovely when it's done. Great stitching progress, too! :D Good to have you back, Anne! Love all those yummy fabrics. Fabulous crafting update! I can't wait to see your quilt progress. The crocheting and stitching progress look great too! Love the fabric choice, it looks fabulous! Oh dear, what a post, full of crafty goodness! Those yummy fabrics got me drooling over the screen, they look gorgeous, lol! All of the other projects look amazing too, you did so much! A lot of fun, lovely projects. It keeps it more interesting to stitch between crafts I think. Lucky you to find the just the jelly roll you wanted. Those colors should make a beautiful quilt. I've never made a full quilt, just smaller pieces using quilting techniques and I've never tried hand quilting. I'll be looking forward to your progress reports! Wow....you have been busy! Love the fabrics you bought, the colours are delish!Good luck with all these projects, can't wait to see more updates on them. Oh what lovely fabric!! It will be beautiful. That book! Yes! I have checked it out from our inter-library loans. It is awesome is it not?! You are so lucky! I love the jelly roll fabric you have chosen for the quilt. It is going to be amazing. I wish I had your confidence to do one. I have been yearning to learn yet scared at the same time. 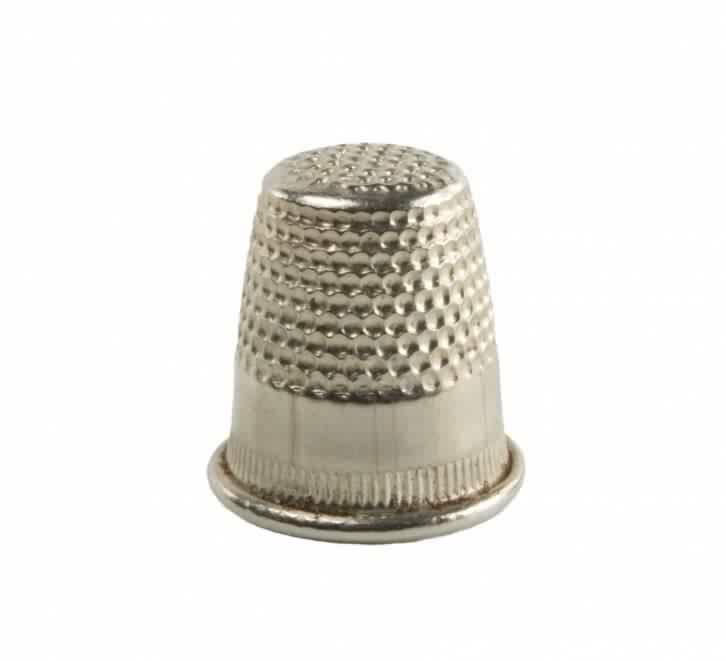 I knew a thimble was for sewing I have never seen anyone use one. I'm loving those colors for the granny squares. You have many talents. You inspire me. BBD's Bluebird as a Redbird is nicely done. Hannah is coming along. Your doing a great stitching job. Cool book and the price you found is awesome! Can't wait to see and hear about your trip. Please tell me the bears were not circling your tent? We went camping in a tent once and a bear decided to explore the campsite. To tell you the truth I haven't been camping in a tent since. 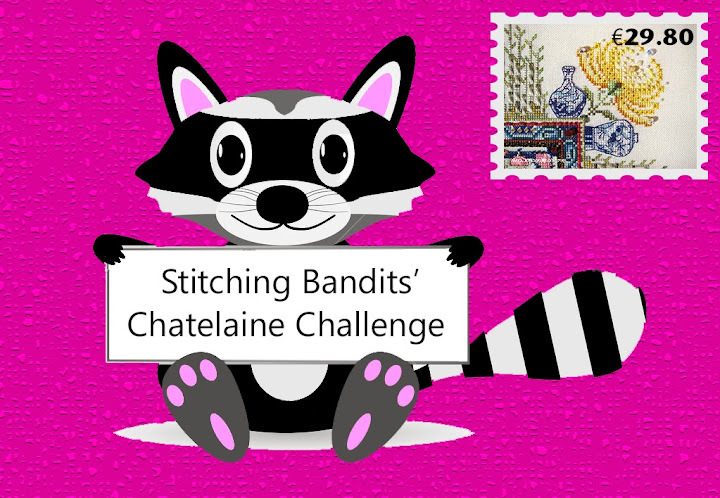 Thanks for sharing your stitching with us! Congrats on the cute finish. Love the fabric and yarn you got. Sounds like a fun trip. Your projects are very beautiful!!! You HAVE been busy! Sorry to be so late in commenting--playing catch-up! Only 100 more to go! I have seen that jelly roll quilting video too... it looked tempting, but I resisted. I am willing to do smallish quilted/appliqued projects with my new sewing machine. Let's see how that goes! Thanks for sharing! Hugs! Glad your persistence finally paid off and you got to visit the quilt shop. :) You sure came away with some lovely fabrics! Nice beginning on your granny square. Lovely stitching too! You got some gorgeous fabrics & I look forward to seeing your quilt progress. You are one busy girl, love all the fabric. You've got a lot going, but it is good for the soul. LOL. Love the jelly roll package and will can't wait to see your finished quilt. Like the colors on your granny square too. Your stitching finish is lovely! I must admit I prefer red over blue any day! Wow you have been busy Anne. I'm glad you're getting things accomplished. And it's awesome that you were able to find your jelly roll at a decent price. Grats on the finish too. I love the color of the bird and leaves. It looks great! I'm on a short break from school so I blogged and am catching up with the blogs I used to follow. I'm glad to see things are going well for you. You're one of the people I try to keep up with, especially since you gave me such a nice gift. Hope you're doing really well!!! Your working on so many projects!! Have fun with it all!! Gorgeous fabrics, quilting is still all new to me. Look like you been very busy with so many lovely projects. You are busy, lots of lovely things to see in this post. Such pretty fabric in the jelly roll you chose. Thanks for stopping by my blog and leaving a comment, its always nice to have new folks say hello. I love Moda frabrics, your quilt will be awesome! I cannot wait to see your holiday pics. The quilt looks lovely but I am not a sewist so I have no advice!! The book looks gorgeous, I love traditional samplers and have a couple of books I love to browse through myself.